Originally posted at Weed Control Freaks. 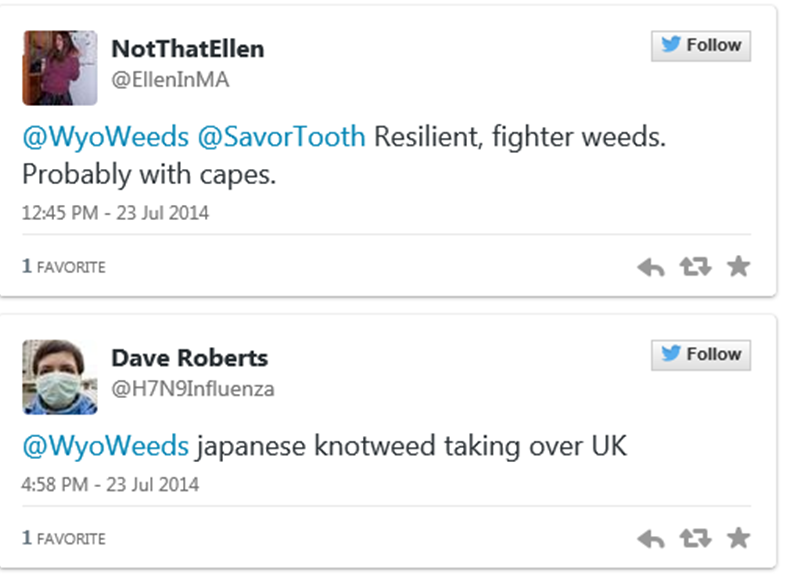 Superweeds have been in the news a lot over the last few months. Most of the recent coverage has been related to new 2,4-D resistant crops that were recently approved by the USDA and the new herbicide formulation (2,4-D plus glyphosate) that the EPA is reviewing. Marc Brazeau recently wrote a compelling piece arguing that our focus on superweeds in GMO crops draws attention away from solutions that could really help make modern agriculture more sustainable. I’ve written about various aspects of so-called superweeds before, several times. In one of my earlier posts on superweeds, I mentioned that the term frustrates many scientists, in large part because there is no agreed-upon definition. Certainly, the term indicates that the weed is super in some way; it must possess some trait that is above and beyond an ordinary weed. Like a superhero that has some ability that the general public does not. So what is this “super” trait that superweeds possess? Can a superweed grow faster than the Incredible Hulk? Or can a superweed spin a web like the Amazing Spiderman? Or maybe a superweed can fly like Superman! Even if everyone can agree that a superweed must have some characteristic that makes it different from an ordinary weed, there are a wide range of opinions on what that super trait is. This ambiguity, in my opinion, has contributed to many misconceptions that are counterproductive to having a rational discussion of weed control, herbicide use, and herbicide-resistant crops. Today, the Weed Science Society of America (WSSA) is announcing a new fact sheet that addresses some of the most common misconceptions related to superweeds. [Full disclosure, I helped develop the WSSA fact sheet, and am quoted in the accompanying press release from WSSA.] I encourage anyone who’s interested in weed management or herbicide-resistant crops to go download and read this 2-page document. But more importantly, I hope that anyone writing about superweeds will check out this resource to avoid contributing to these misconceptions. I wanted to provide some of my thoughts here on why I think using the word superweed has actually contributed to misunderstandings about herbicide-resistant weeds and GMO herbicide-resistant crops. Interestingly, I think the issue boils down to the fact that the meaning of the word superweed has mutated and evolved almost as much as any weed it has been used to describe. There are at least three distinct connotations attached to this word, which, in my opinion, has led to a conflation of three separate issues related to weeds. To illustrate some of the confusion about this term, I asked people on Twitter what they thought of when they heard the word superweed. Now, my twitter followers are most definitely not representative of the general public, but the responses to this question are enlightening nonetheless. Many of the responses were squarely representative of one of the three distinct connotations that the word superweed carries: terrible, horrible, no-good, very bad weeds. No specific characteristics were mentioned in most cases with this particular connotation (except maybe for the cape); there’s just something extra ‘weedy’ about them. Maybe they’re really tall, or really fast-growing, or really difficult to kill. Maybe they’re more aggressive than the average weed. Maybe we can’t quite put our finger on it, but they’re definitely worse than usual. But there is a second, and more prevalent, connotation associated with the word superweed. 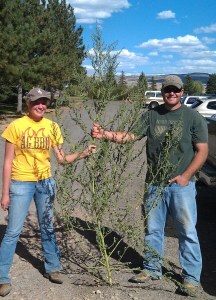 A large group of people tend to associate the term superweed with herbicide-resistance. If you look at the context of most recent news articles using the word superweeds, this really isn’t surprising. 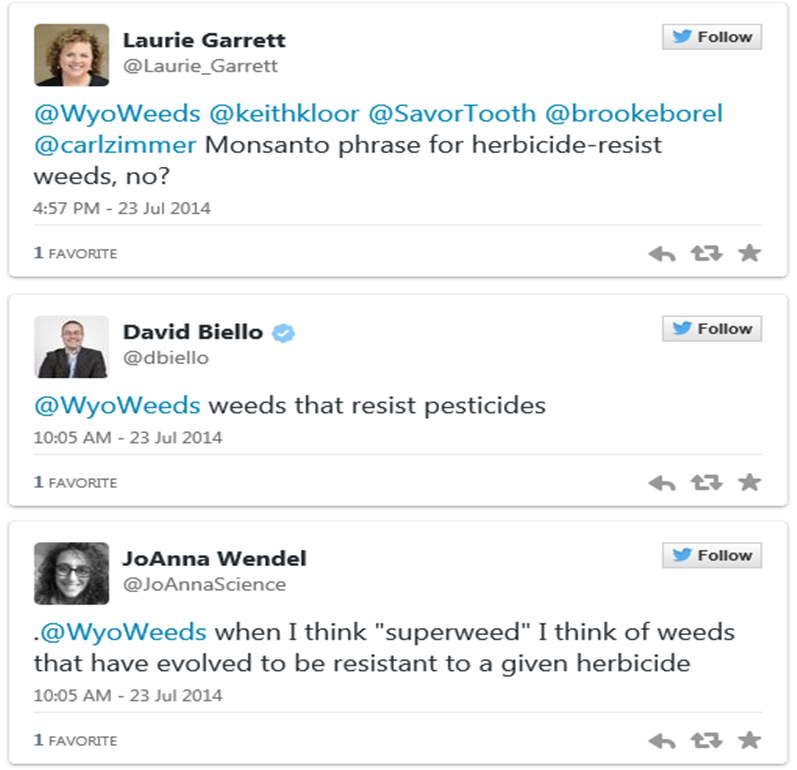 Nearly all of the articles about superweeds have something to do with herbicide resistance. 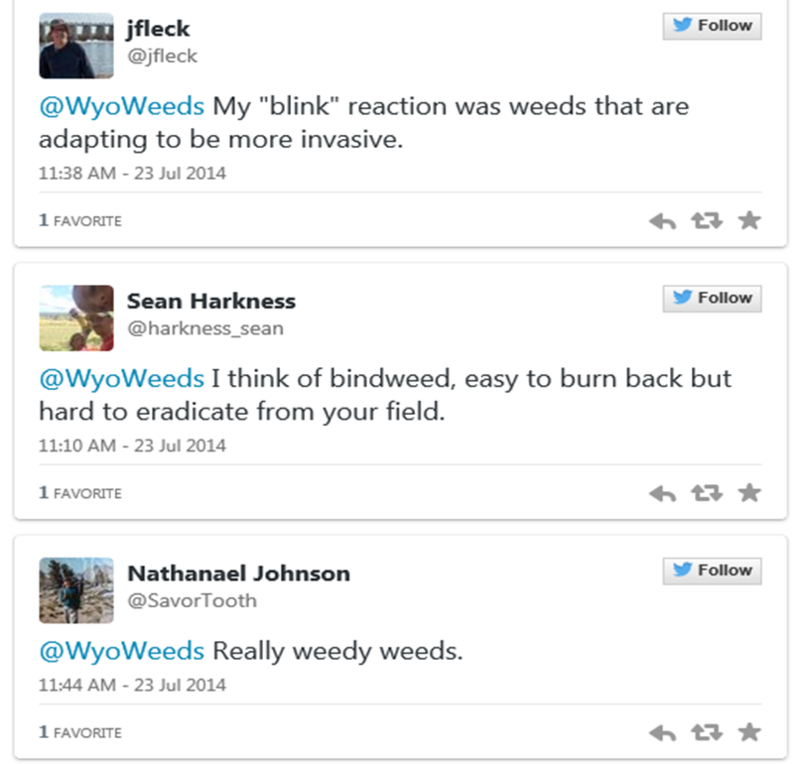 The twitter responses above didn’t mention a specific herbicide or crop; just that superweeds were resistant to at least one herbicide (or pesticide). But in most cases when superweeds are discussed in the media, especially recently, it is in relation to glyphosate-resistant weeds that evolved in glyphosate-resistant (Roundup Ready) crops. And I think its use in this very specific context may be driving some of the misconceptions. This definition says a superweed is not just resistant, but extremely resistant. And not only that, but it probably became resistant after receiving a gene from a GMO crop. Other dictionary definitions that show up near the top of Google results for the search term superweed are even more definitive about gene-jumping being the cause. By these definitions, a superweed has a GMO crop gene. At least one article about weeds uses superweed in this context (and explicitly defines it this way). So we’ve got three pretty different potential meanings for the word. A superweed can be a “really weedy weed,” or it could be a “herbicide resistant weed,” or it could be “a weed that hybridized with a GMO crop.” The word superweed might mean different things depending on who’s writing the article; and it could be interpreted to mean different things depending on who’s reading the article. Certainly, this isn’t ideal. But there are many words in the English language that can mean different things in different contexts, so why is this a big deal? The problem arises when the connotations become conflated. 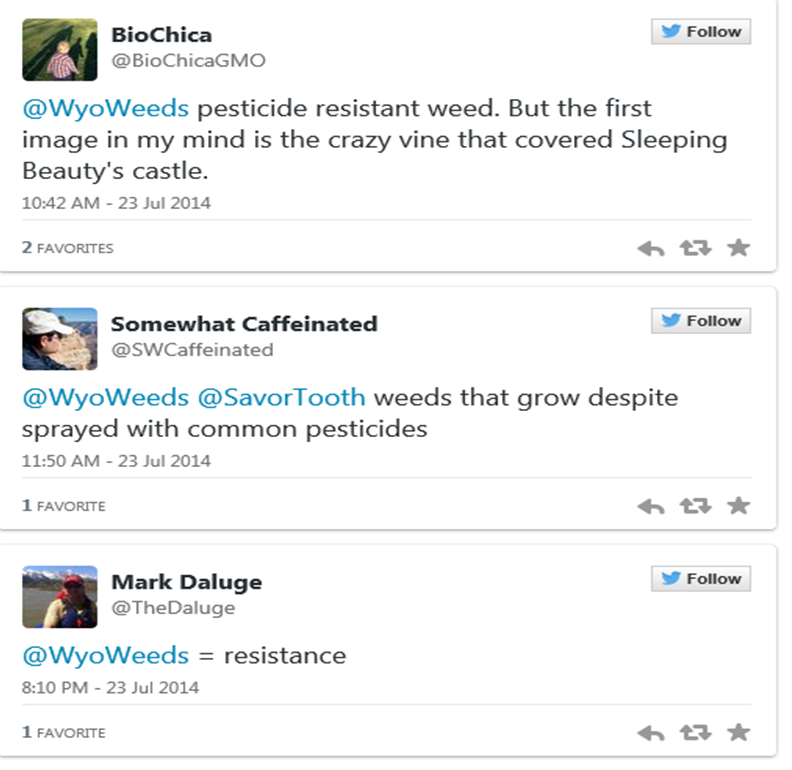 Most uses of the word in the media relate to herbicide resistance. But because many people associate superweeds with extra aggressive or vigorous characteristics, there is a real possibility for some readers to think that the weeds are extra aggressive or vigorous because they are herbicide-resistant. But this is simply not the case. That 7-foot tall glyphosate-resistant superweed you just read about would be 7-feet tall even if it weren’t herbicide resistant. Likewise, there are many weed species that produce hundreds of thousands of seeds per plant, even if they’re not resistant to herbicides. Herbicide resistance doesn’t confer any additional super-abilities; it just makes the weeds more difficult to kill with herbicides. Also, very few articles about superweeds inform the reader how the weeds became herbicide-resistant. The mechanism by which weeds become resistant is a detail that is usually inconsequential to the broader story the journalist or food-writer is trying to tell, so this isn’t surprising. But if a reader wonders how a weed became a superweed, the answer they are likely to find by searching for the definition is at odds with the way most writers are using the word. If someone were to read an article about superweeds in GMO crops, and then search for the definition of a superweed, they could easily come away with the idea that the weed absorbed a gene from a GMO crop. Based on the information available on the web, this would be a perfectly plausible conclusion for someone unfamiliar with the intricacies of plant breeding. Then add to that the idea that the gene also somehow made it grow bigger and stronger and more “virulent”. We now have a mutated definition of superweed that combines all the super traits associated with the word. A completely justified conclusion; except that it is almost completely untrue. Crop to weed gene flow is relatively rare (for reasons well-described in the WSSA fact sheet). Most superweeds in recent news articles (like Palmer amaranth) did not become herbicide resistant by trading genes with GMO crops. And there is no reason to believe that even if this did occur, it would make the weed any bigger, stronger, or allow it to produce more seed compared to non-resistant weeds. 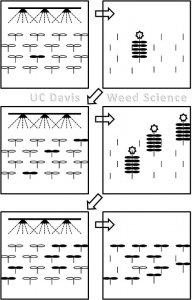 Herbicide resistance in weeds is an evolutionary process. A common misconception is that herbicides “cause” resistance; however, herbicide-resistance is usually due to naturally occurring mutations. On a population level, organisms occasionally have slight genetic mutations; some of these are lethal (ie. a plant that does not produce chlorophyll), some are beneficial (ie. drought tolerance) and some are neutral (no observable effect). Sometimes, these mutations allow the plant to survive a particular herbicide. Herbicides don't actually cause the mutations, but repeated application of herbicide preferentially selects for those plants that can survive. As Bill Price recently said “There are biotypes out there resistant to control measures we haven’t even invented yet.” But we’ll eventually find them. In reality, the superweeds in most recent news articles aren’t really any different than the herbicide-resistant weeds we’ve been battling for 50 years. That doesn’t mean herbicide-resistant weeds aren’t a problem, quite the contrary. But it isn’t because they are resistant that they are problematic; weeds are problematic because they grow tall, they are aggressive, they damage harvest equipment, they produce a lot of seeds, etc. Weeds, in general, are pretty super. And they possess these traits whether they are herbicide-resistant or not. Herbicide-resistance simply removes one powerful tool out of the many we use to control weeds. If we really want to have a rational discussion about the impact of weeds, resistance to herbicides, GMO crops, or herbicide use, it is counter-productive to continue using a term that only creates more confusion about all of these things. It would be nice if we could stop using the term superweed, and instead just say what we mean. Because after all, in nearly all cases, a superweed vigorous weed was already a superweed difficult to control before it became a superweed herbicide resistant, and it probably isn’t even a superweed crop-weed hybrid. As a postscript, I must admit I’m disappointed nobody in my informal twitter survey mentioned “alien possessed” superweeds. If you want to see some truly scary superweeds, watch this Outer Limits clip starring Eddie Albert and June Havoc. I will never be able to turn my back on superweeds tumbleweeds again. You can watch the full episode here. Updated 8-October-2014 to add information about selection of resistant biotypes. The responses on all GMOAnswers.com websites do not necessarily reflect the views of Council for Biotechnology Information member companies.